He is the only one range heroes from three Panda from DotA with the storm ability. He could do teleport to another place so fastly. He could suddenly move onto front of you , and he could moving out if you want to kill him. His ulti's movement speed was very unbelieveble. so don't think to chasing him just using your kellen dagger's, blink, windwalk or another easily because he could move faster. But, unfortunately this ability had a limits. That's are something absolute because if there haven't a limits, this Hero would be imbalance, right?? So what is the limits of this heroes? Raijiin can move fastly because of his ultimate skill to jumping arround from one place to another place, but it will decrease his mana. If he jump longer, his mana will decrease much more. Correct, The limits is the mana point. 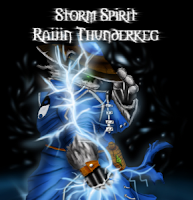 A celestial being summoned to aid the Sentinel in their darkest hour; the Storm Spirit chose to manifest itself in the life essence of a humble elementalist, Raijin Thunderkeg. Though the Pandaren's soul perished during the profound surge of pure electrical essence, the divine entity even now seeks refuge in Raijin's body, unable to thrive on its own. However, despite its mortal imprisonment, the Storm Spirit is far from being limited of its tremendous powers. Able of manipulating vast, inexhaustible sources of energy in mysterious ways, it swiftly hails destructive sparks of lightning upon the Sentinel's adversaries, eradicating all that dared to cross its path. This build are aimed to people who have an intermediate skill above, not some novice player. I think Raijiin is to difficult for novice, you must have some good reflect to use this hero properly. On this build you'll have to play with Power Up, Often to see the mini map and the time are the key to successing this build. Empty Bottle- Use this item to bottling up PU, It's a very useful item to replenish your HP and MP. Preserverence-Buy this to speeding up your HP and MP regeneration. Orchid Staff's - Buy this item to shut off the enemy's int hero. After this, you can build the hero with your own style . If you like to do support role, you can buy a Guinshoo. If you want to do carry role, buy Monkey King Bar or Mjolnir. Buy something that can increase your hit and attack speed. Use Static Remnant for creeping in the first 10 minutes. It will make you easier to get the first's three item on the list. Buy void stone first if you like. Don't use Ball Lighting for a long range. Keep your mana >= 200 MP, So if you're in trouble, you could use your Ball Lightning to the cliff. If your item reach the step number 5(Blood Stone), Use the Ball lightning in short range, then hit the enemy, do static remnant, then hit the enemy again, do it repetitive, so the enemy will affected by Overload. Overload give some plus damage, and make the enemy's movement slow down. If in war position, jump using ball lightning into the most fragile enemy(usually INT or Support), kill him fast, and the position will be 5vs4 after that. That's all, You can develop it by yourself if you think this build is not suitable with your style. But i think, the most of the gameplay will be the same.